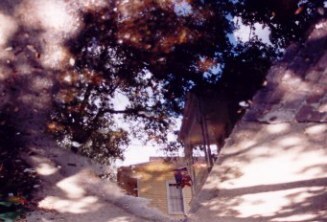 After the devastation of Hurricane Katrina, some people said that New Orleans should not be rebuilt. 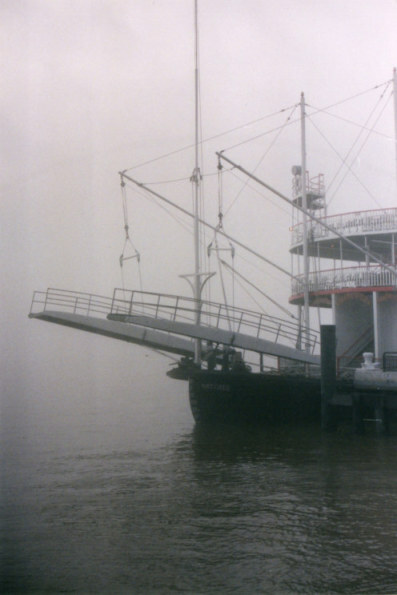 Second: New Orleans was a city before there was a United States of America: it is one of the most important ports of the country - and where there is a port, there must be a city. New Orleans, suffers from the misconception that people think that because Carnival is celebrated with such passion and with the full-blown involvement of the whole community it is just a 'carnival town – and not a place of serious business. The same accusation was levelled at my other favourite city, the ancient city of Mainz (in French 'Mayence') on the River Rhine in Germany. For its like passion, I dubbed Mainz 'New Orleans on the Rhine'. 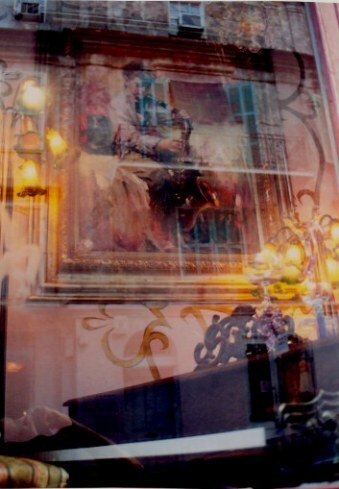 Mardi Gras in New Orleans and Fastnacht in Mainz the same festival celebrated at the same time and with the same zest. Mainz turned this insult into a musical 'thumbing of the nose' by singing a song 'We’re just a carnival association' (Wir sind nür ein Karnival Verein) - every time their football team Mainz 05 scores a critical goal. Richard Florida’s research The Creative Class gives clear evidence that creative cities are business attractors. Florida has been sought out by governments worldwide to help them identify how to nurture a creative 'sense of place' and to attract business and talent. As with many other cities that are accepting of a little eccentricity, both New Orleans and Mainz in Germany seem to have done this naturally to qualify as creative cities. Their levels of innovation, leading business and university rankings, show that such cities make an economic base that is not easily shaken by the variances of economic ups and downs. The way New Orleans went about reconstruction following Hurricane Katrina - despite slowness of official assistance - is a lesson for us all - and demonstrative of a real business community. I have often thought that New Orleans is the most un-American of cities – and I mean this as a compliment while not disparaging other cities in the USA which I have experienced - and which also have their own style and personality. It is also shares the same characteristic as Mainz in being large enough to be a city and small enough to be a village…where news (and gossip) travels fast. 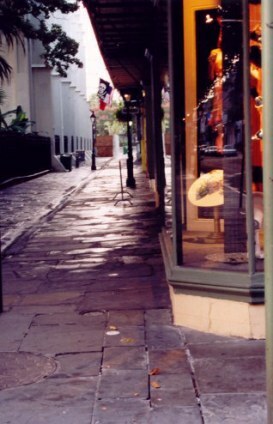 The heart of New Orleans is the French Quarter. With its charming architecture and colour, the city reflects its Spanish and French roots. 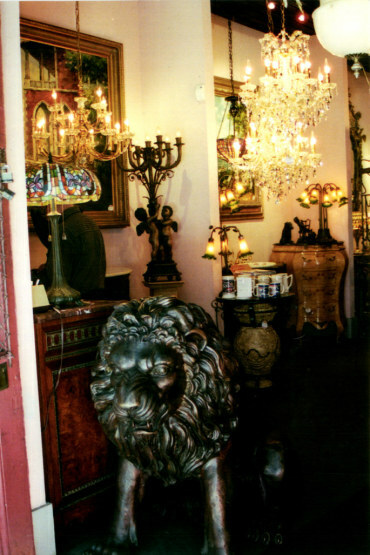 It has many antique shops: like this one - where you are greeted by elephants and escorted down the entrance alleyway by serenading ladies, seated musicians – and other bronze images. …and others with collectors pieces of every era. Perhaps you are a collector of a different sort, and choose to fight battles in miniature. In this case, the Toy Soldier shop is a good place to enlist an army. 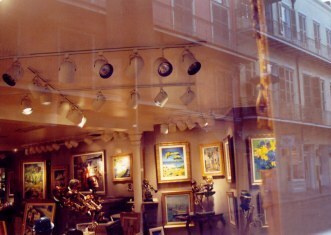 Some shops have an eclectic mix of art and antiques. Everywhere, the lovely architecture is reflected. 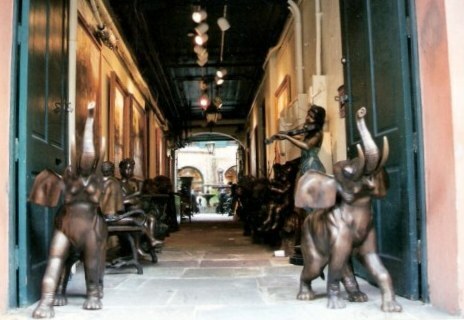 The French Quarter is like fairyland. It is a place whose charm seduces all who appreciate the art of life: things beautiful, and that passion for life and its celebration that we so often lose in our pursuit of material wealth. 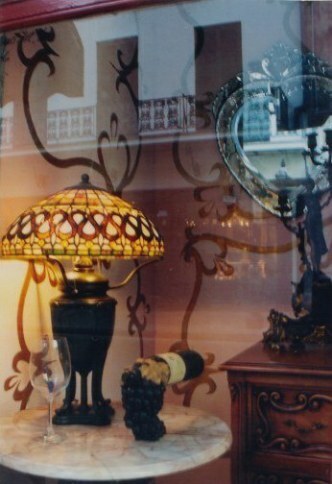 My memorable first tango in New Orleans was at a little café on St. Charles where the Parisian style tables were pushed to one side to allow dancing on the small hexagonal black and white tiles. It was a long wait for that first dance but I was quickly adopted by the group and they carried me off with them after dancing tango - to The Circle Bar on Lee Circle. Built around 1883, and being an unlikely and quirky mix of architectural styles eadded over the intervening years the building was once the medical office of the first licenced female doctor in Louisiana, Dr. Elizabeth Magus Cohen. 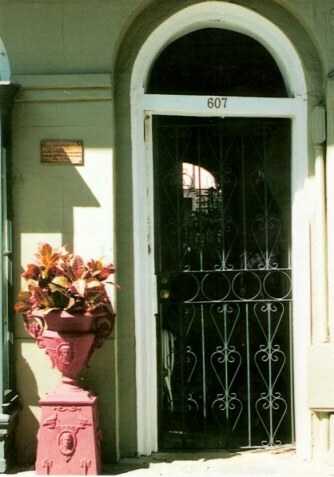 Dr. Cohen came to New Orleans in 1857 after qualifying in Pennsylvania and practiced in the city for over 30 years, becoming a leading, mucyh-respected surgeon. 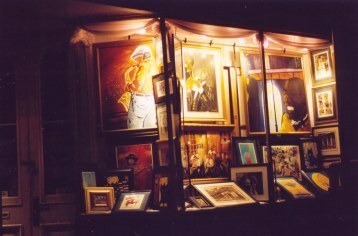 One of the oldest bars in New Orleans, the building now known as The Circle Bar perches on Lee Circle to welcome – from 4pm to 4am – people who enjoy variety in their music. The clock on the ceiling (so you can see it after one too many drinks?) was permanently at 10 to 10 – so you never felt it was really too late for another drink. but I did have to work early the next day. 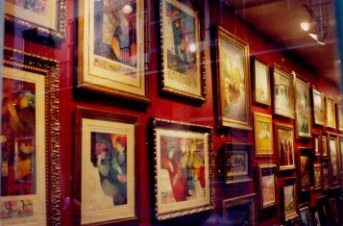 My lift back was diverted to show me to a marvelous collectors shop in the French Quarter, owned by my driver. Peering through the window, I saw some advertising cards for 1950’s cars and commented how my brother would love them. Within minutes we were inside so I could look more closely. Then I commented on the high stack of tango CDs. One was quickly selected. 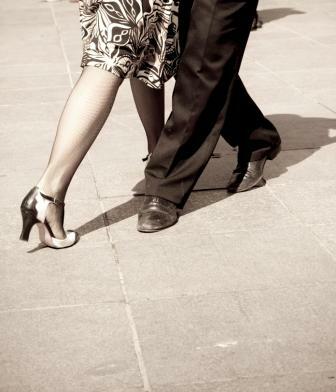 I was offered a glass of red and a tango dance – both, naturally Argentinean, like the shop owner. It seemed rude to say “No”! It is a night I will always remember. 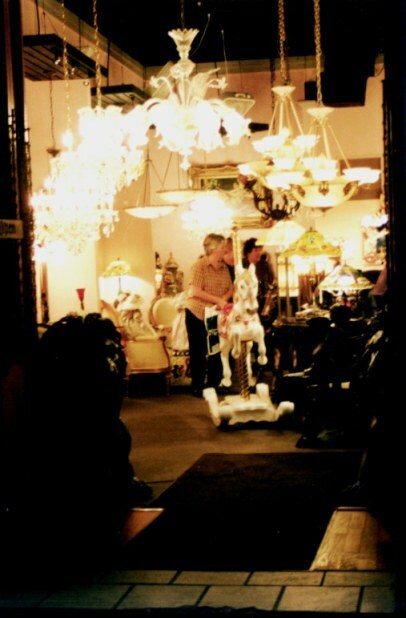 We danced in and out of the antiques, the shop lit only by the antique lamps, here a Tiffany, there an art deco nubian slave holding a pasha - until I really DID have to go. Closing up the shop, we drove back towards Canal Street, which runs between the French Quarter and the business district where we had started. I commented that it was a lovely way to have my first tango in New Orleans. My driver agreed and sighed, saying that it was, but he had always wanted to dance tango on the streets - like in memorable scene in the film Tango Lesson [DVD]  with Pablo Veron and Sally Potter. The car stopped behind some fenced-off road works where the Canal Street Tramlines were being reinstalled. With both front doors open so that the tango CD at full volume poured music into the warm summer night, the inside lights of the car shed a soft light onto the pavement as we danced. What could be more hypnotic than that? That is how I came to dance up and down Canal Street, New Orleans, in the early hours of morning, washed in warm light that cast long shadows and caressed by seductive melodies of tango - to make a memory I shall never forget. 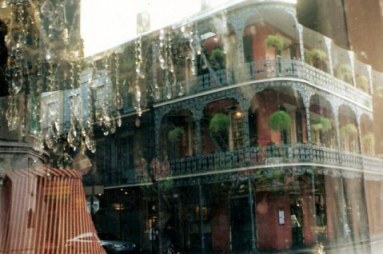 Passers by stopped and watched before moving off, shrugging and smiling – for after all, what else does one expect but the unexpected in New Orleans – a city of dreams? 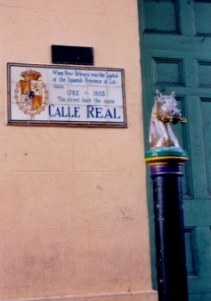 The similar architectural character and individual personality of New Orleans to that of Havana seems evident to those who know them both. New Orleans was secretly passed to Spain by the British following their victory in the Seven Years War. However, the New Orleans Spanish Governor didn’t arrive until three years later – only to be hurried off forcefully – but bloodlessly - back to Spain by French and German settlers hoping for re-unification with France. The Spanish re-asserted their control a year later. From then on, for many decades New Orleans shared the same Governor as Cuba. However, there was another secret deal done in 1800 when Louisiana was passed back to France. This allowed for New Orleans to remain under Spanish control until it suited the French to assume their right. This they did ceremonially – for 20 days - before the formal hand-over of Louisiana (which at that time consisted of parts of what are now several other states) following its sale in 1803 by Napoleon to the United States in what we know as the Louisiana Purchase. In the intervening years, on Good Friday 1788, over 800 French-styled wooden buildings were burnt to the ground by a devastating fire. Another less destructive fire followed in 1794. Buildings were rebuilt in the Spanish style – with brick construction, firewalls, iron lace balconies, and airy courtyards. 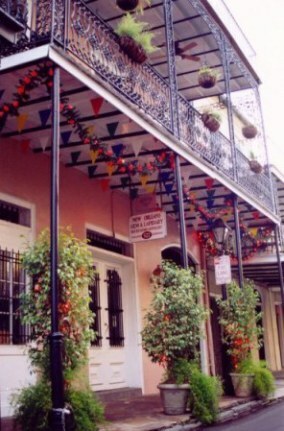 The legacy remains, with a Spanish touch adding its bit of magic to the French Quarter. 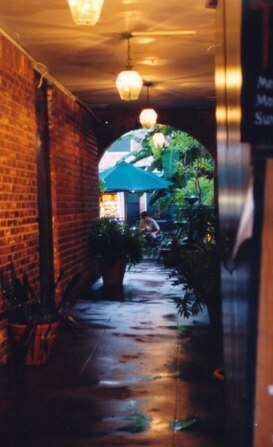 ...and allies leading to inner courtyards give some indication of the extent to which the 'hidden' parts of 'the Quarter' as the French Quarter is locally known, owe their architectural legacy to Spain. 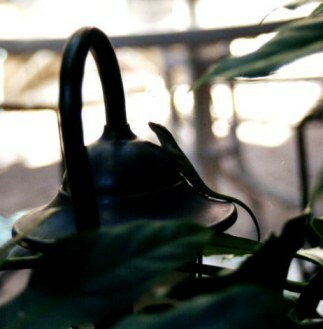 In one such café courtyard, this small vignette played out before us as we waited for coffee after a late, lazy lunch. 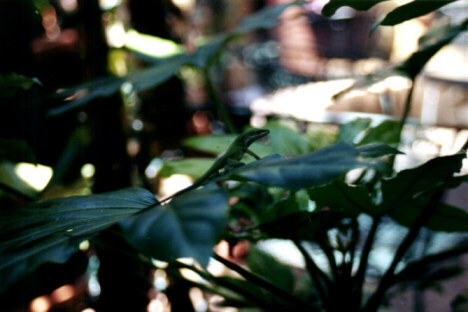 A quick movement in the plants beside us caught my eye. I am Australian – and our insect life is something to reckon with if you don’t want to be bitten – so I was probably more attuned to it than my friends. 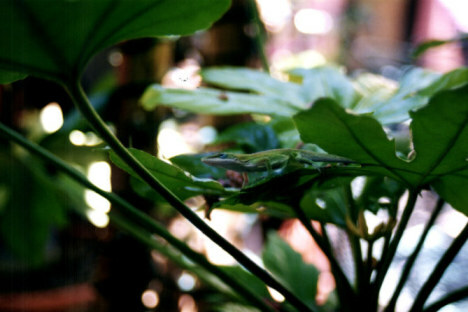 In fact, it was small lizard. He was watching something very carefully. 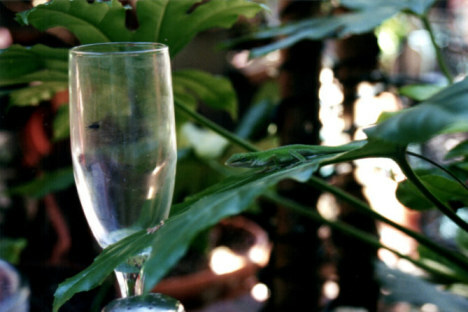 We soon saw that his proposed lunch was the fly that had landed in an empty champagne glass on our table. 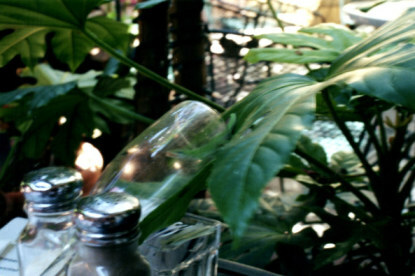 Realizing that the angle of the glass made his lunch a bit difficult to secure, we intervened, while the lizard waited. 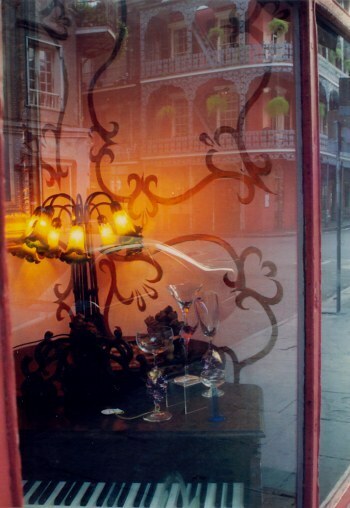 The glass tilted on an angle and held in place with the Salt and Pepper shakers gave the perfect angle, and with a quick dart – our little green friend also enjoyed a French Quarter courtyard lunch. 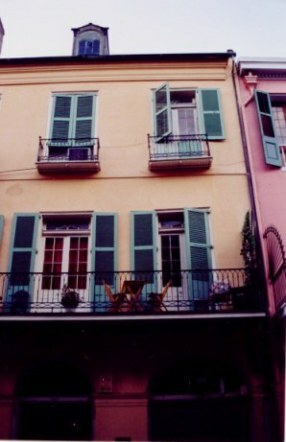 The French Quarter is a place where the same view gains new life when seen from new angles. 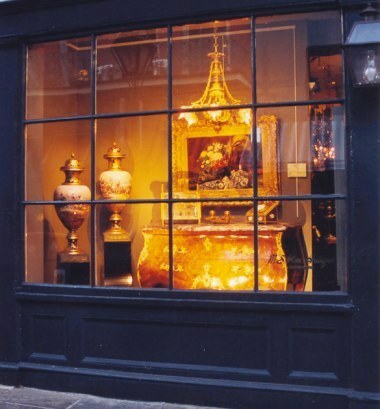 This famous and much photographed street corner, seems brought alive from the chandelier crystal viewpoint looking outside from an antique shop. Seen from another angle from the same shop, it takes on new characteristics. 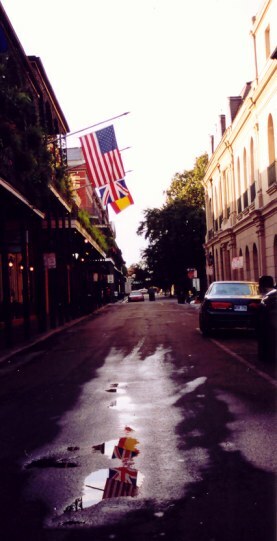 The mix of nations that has influenced the formation of the unique character of New Orleans is always notable – even after a rain shower. 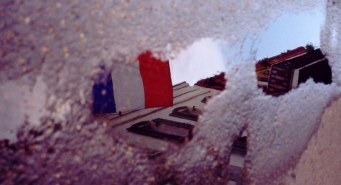 … and the French Flag – reflecting an influence that is never far away. A visit to the French Quarter is supposed to not be complete without a beignet at Café du Monde. 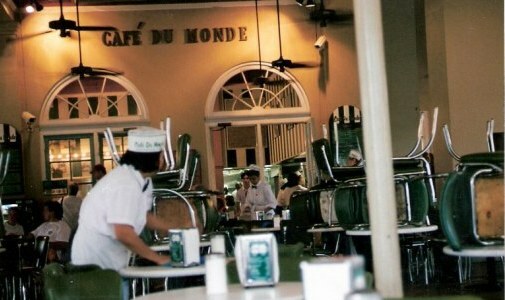 Café du Monde has been open 24/7 – Christmas Day and a passing hurricane excluded – since 1862. I always preferred to savour my beignet on the way home after a long night of music and dancing, after cutting down Pirates Alley to the waterfront. The chairs might be stacked up for café cleaning – but the place is still open - so I could enjoy my black coffee or Café au Lait (half coffee, half hot milk) and fresh baked beignet. 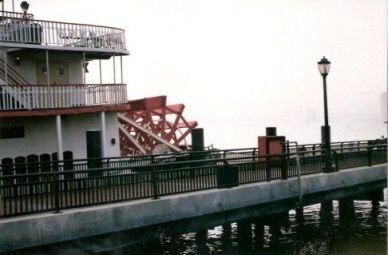 …its red wheel standing out against the blurred grey image of the distant bridge. 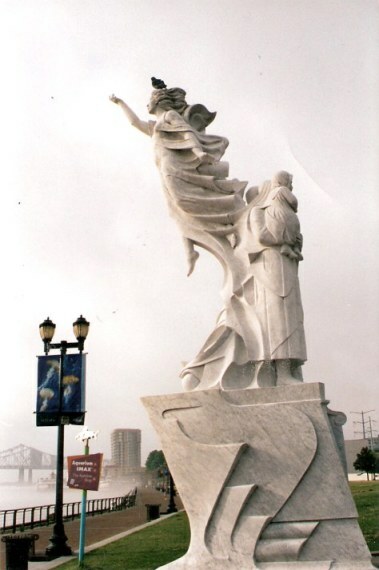 ..and the Immigrants Statue eternally reaching out in welcome, with a pigeon perched on her head as she reaches out to sea while the man behind her looks inward to land – child in his arms. 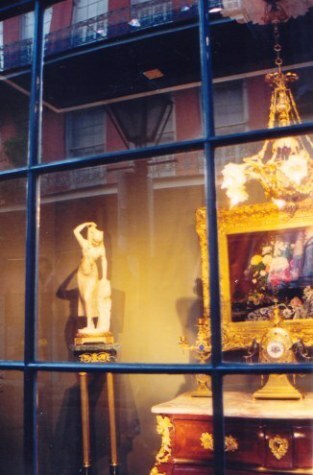 I am so glad to have lived just eight minutes walk from The French Quarter and to have enjoyed so much passion in creativity and sheer enjoyment of life in New Orleans. when we hit New Orleans. Some of us just belong here. Some places wrap around your soul and they stay there no matter if you stay or not. 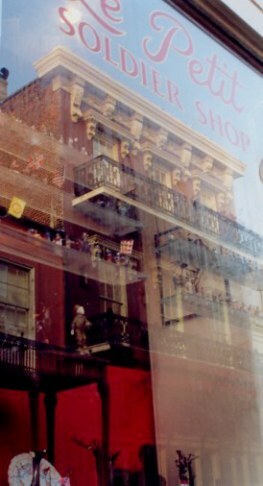 That is New Orleans: passion, wit, a bit of chaos, frayed edges, irony, and culture in its fullest sense. My friends all told me it was a voodoo town. For those who have had the extreme good fortune to live there, New Orleans is a place you never want to leave – and if you do, it lives on always in your heart. For anyone creative – it is Mecca.